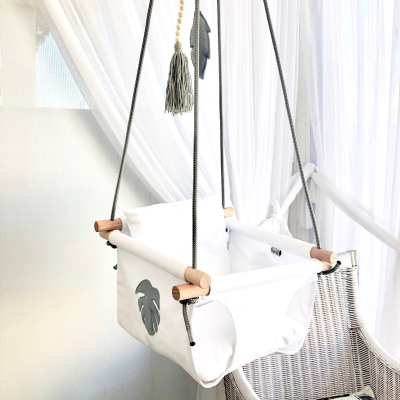 The Tiger Lily Swing makes the perfect accessory for any home. Not only does the swing provide a wonderful parent-child bonding time, swinging also helps littlies to process sensory input. And a toddler or two may have been known to fall asleep in their swing (it is not safe to leave them in the swing unattended). The swing is made from cotton (twill or canvas) and is decorated with felt applique. The ropes are protected against friction with industrial strength steel components and a snap hook makes for easy installation. Each swing set comes with an adjustable safety belt and 2 removable cushions. Please note that you need a hook or branch/beam to hang your swing from (not included) and an additional length of rope is provided to help with an easier, adjustable installation. Your child needs to be able to sit on his/her own to use the swing and the swing setup can hold a child up to 30kg. Please check the swing regularly for general wear and tear. Our Felt n Tassel Garlands work perfectly as an accessory. Notify me when White Swing Swing is available.